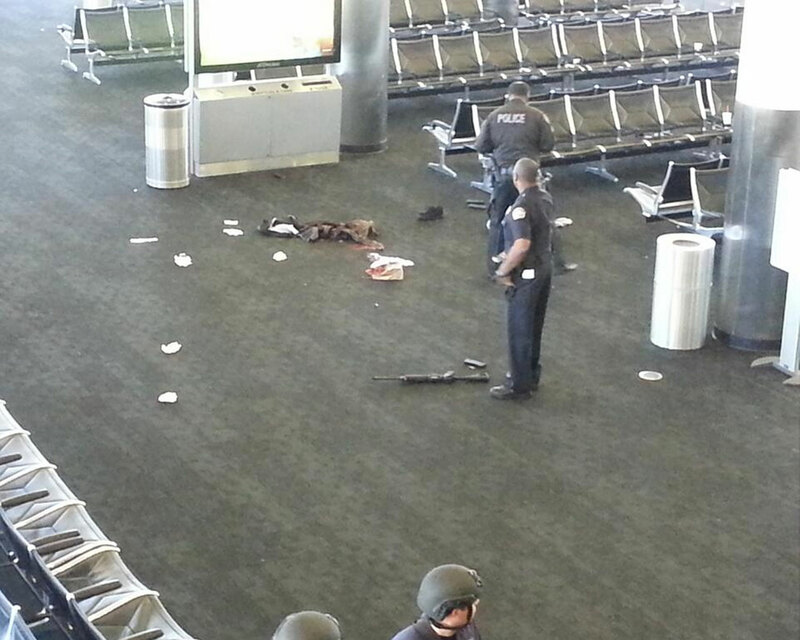 Law enforcement inside LAX terminal 3 after a shooting at the airport, Friday, Nov. 1, 2013. (CBS) LOS ANGELES - U.S. law enforcement officials confirm that Paul Anthony Ciancia, 23, is the suspected gunman in Friday's shooting at Los Angeles International Airport. They say he has a family address in New Jersey. Officials also say he spent some time in the Los Angeles area. A preliminary review of the terror data bases and watch lists find no connections to Ciancia. And he does not have any significant police record. Also, sources say, despite some reports to the contrary, the suspect is still alive. Law enforcement sources told CBS News that "anti-government, anti-TSA writings" were found in the shooter's carry-on style bag. Authorities believe a lone gunman was behind the shooting at LAX Friday morning that left multiple victims wounded, Los Angeles Airport Police Chief Patrick Gannon said at a press conference. Gannon said the gunman was taken into custody following an officer-involved shooting. Officials say it is a "static situation." He said the individual was tracked through the airport and authorities engaged him in gunfire inside Terminal 3. It was then that the suspect was taken into custody. Los Angeles Fire Chief Jim Featherstone said the Los Angeles Fire Department treated seven individuals and transported six of those individuals to area hospitals. Dr. Lynne McCullough has confirmed Ronald Reagan UCLA Medical Center received three male victims from the incident. She said one of those victims is in critical condition and the other two patients are in fair condition. CBS Los Angeles confirms one 40-year-old male is dead in connection to the shooting. Officials would not release the identity of the suspect and said they could not confirm reports that the gunman was a TSA employee. A federal official tells CBS News the shooter was not a current or former TSA employee. The investigation is being handled by the FBI. CBS News' John Miller reported that a law enforcement source said the gunman was wearing a camouflage battle dress uniform and that a large box of ammunition was found at the scene. Gina Marie Lindsey, Executive Director of Los Angeles World Airports, said in Friday's press conference that LAX is still accepting some incoming flights. She said almost every flight out of the airport Friday will be significantly late.